MS2000M The Ultimate Cordless, High Torque, Lightweight, Cleaning Machine. 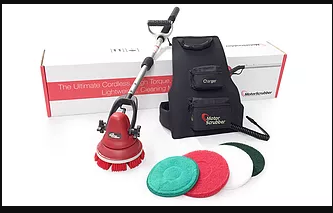 MotorScrubber quickly and effortlessly cleans your washrooms, showers, stairs, skirting / base boards, windows, swimming pools, motor vehicles and other hard to clean areas. 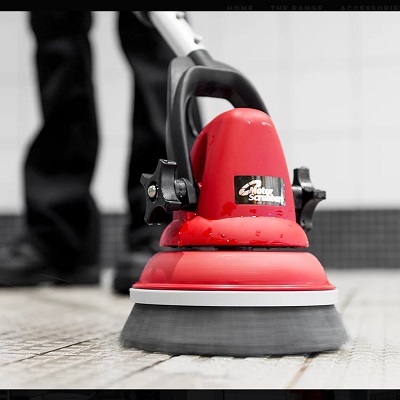 Designed for safe and reliable use, this is the ultimate scrubber. EFFECTIVE CLEANING The reliable high torque motor allows for fantastic washing, polishing, cleaning and grinding results. 4 HOURS RUNTIME A real workhorse with an impressive 4 hours runtime from one charge. Taking only 8 hours to fully re-charge. LIGHTWEIGHT Weighing only 2kg (4.5kg with the harness) it is extremely lightweight to use yet heavyduty in its construction. CORDLESS Super portable, you can use it anywhere; stairs, swimming pools, motor vehicles, it's ideal for all hard to reach areas. 100% WATERPROOF* The MotorScrubber is 100% waterproof and submersible in water with no shock risk due to its extra low safe voltage.